St. Lazerian’s Church Kildavin is situated on a little hill overlooking the village of Kildavin and the beautifully scenic Blackstairs valley. Generations of Kildavin people have worshiped here and this church has witnessed the christenings, weddings, funerals and many of the life celebrations of this community. This church dates to circa 1830. Initially it was a fairly simple building and in 1860 was described as having a mud floor and no seats. The Parish Priest at that time, Fr Dunne, arranged for a stone floor to be installed and also for the seating arrangements to be improved. This work was funded by selling some of the ‘seats’ to more wealthy parishioners. £7 and upwards could guarantee you a family seat. 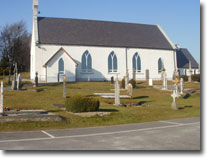 The name of Cardinal Spellman is associated with Kildavin and his grandmother and ancestors are to be found in the graveyard surrounding St Lazerian’s Church. The church has undergone renovations in recent years having had the roof replaced in 2009 and all the windows and carpets replaced in the recent past.